Meet Bernie! Bernie was Annie's pet Dutch rabbit. When she started the company, Annie chose him to be our official "rabbit of approval" representing the simplicity, care and goodness in all of our products. In celebration of nearly 30 years of mac & cheese goodness, we've gone all out to make it better. In that spirit, our mac & cheese masters headed back to the kitchen on a mission for more yum. After hundreds of batches and licked bowls, we came up with a richer, more flavorful recipe. Even the noodle got an upgrade for better texture! You'll notice, however, that one thing is staying the same - our commitment to never using any GMOs, artificial flavors, synthetic colors or preservatives. *Yummier than our previous recipe. Stir in: Pasta, bring to boil. Cook 6-8 minutes, or until done, stirring occasionally. Extra Tasty! Add: 1/2 cup reduced fat milk and 3 Tbsp salted butter to the warm saucepan. 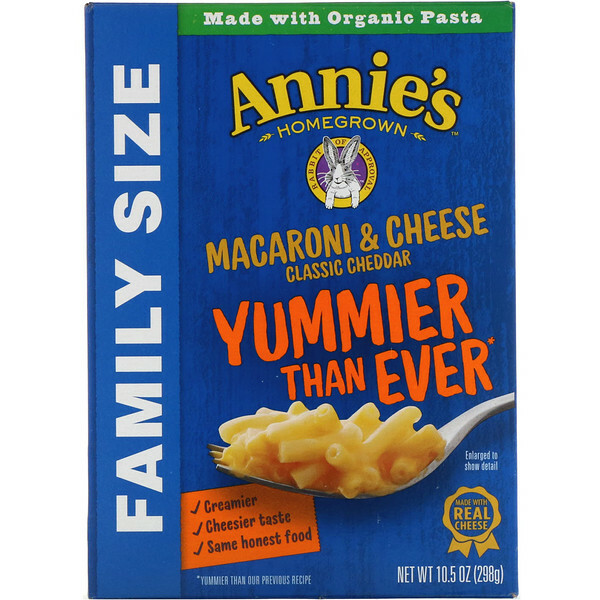 Annie’s Suggestions: For an even richer flavor, add an additional 2 tablespoons salted butter. For a creamy, tangy version, replace milk with 3 tablespoons of plain whole milk yogurt. Enjoy! Organic pasta (organic wheat flour), whey, cultured cream, nonfat milk, salt, butter (pasteurized cream, salt), dried cheddar cheese (cultured pasteurized milk, salt, non-animal enzymes), corn starch, citric acid, annatto extract (for color), lactic acid, sunflower lecithin, sodium phosphate, silicon dioxide (for anticaking). *Amount in dry mix. As prepared with 1/2 cup reduced fat milk and 3 Tbsp salted butter, one serving provides 12 g total fat (7 g saturated fat), 35 mg cholesterol, 620 mg sodium, 52 g total carbohydrate (8 g total sugars), 10 g protein, 0.5 mcg vitamin D, 140 mg calcium, and 300 mg potassium. **The % Daily Value (DV) tells you how much a nutrient in a serving of food contributes to a daily diet. 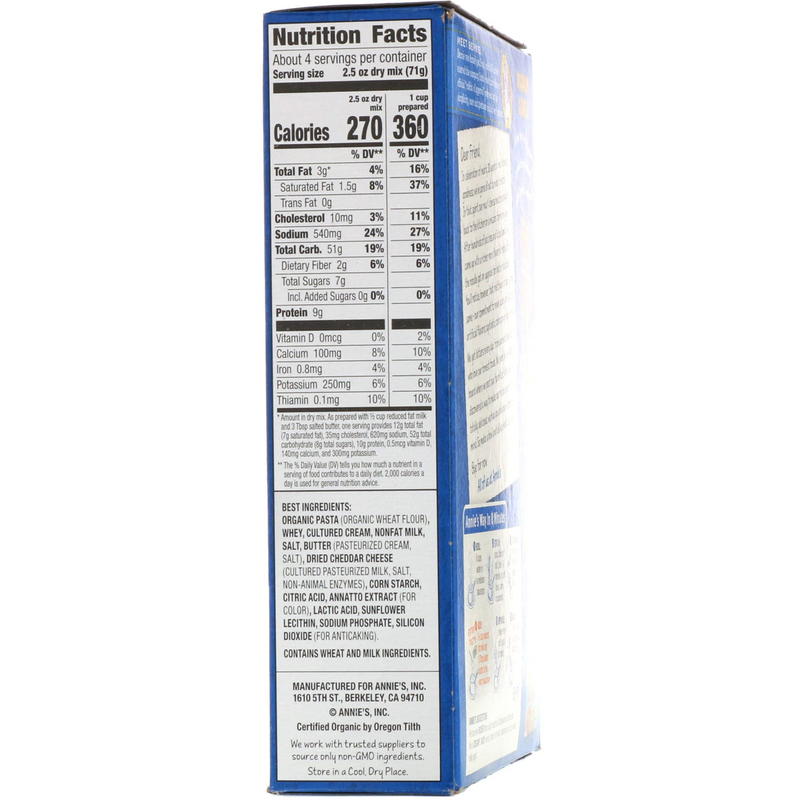 2,000 calories a day is used for general nutrition advice.